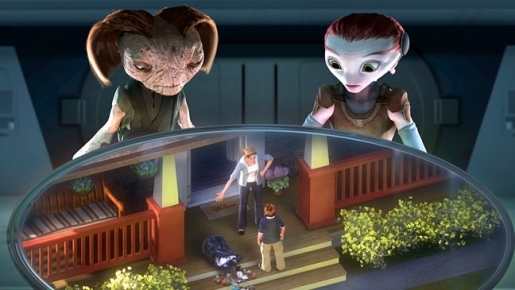 Mars Needs Moms is as bad as this screencap suggests. The year 2011 was not a good one at the movie theater. It’s not exactly the year of the bombs, but movie attendance was down even as prices continue to rise. That means some very expensive movie investments became harmful expenditures by companies trying their best to turn a profit. It’s not as if 2011 was the year of the box office bomb, but it was bad for some unlucky folks. You can find the Hollywood Reporter’s 2011 flop rankings, but allow me to spoil a few of them for you: 2011’s biggest flop was the Disney dud Mars Needs Moms, which made only $39 million on a reported $150-million production budget. Now, I saw Mars Needs Moms in the theater, and I can tell you that its status as a flop is well-deserved. The movie itself is disturbing (uncanny valley) and poorly written, even if it is well made. As for the other movies on the list, they’re hardly flops. Second place flop Sucker Punch didn’t make a lot of money, but it did break even on production with its box-office grosses; ditto Arthur, the remake that landed third on the list. Of course, you could have made Arthur and Sucker Punch for the cost of Mars, which makes the flop all the more painful.